A bit of an art museum/gallery-focussed post… And when I say ‘post’, I mean ‘vaguely related series of random thoughts’… but these ideas have been building up and I might as well get them out to help get them out of ‘draft’. Following on from various recent discussions (especially the brilliantly thought-provoking MCG’s Spring meeting ‘Go Collaborate’) and the launches over the past few months of the Google Art Project, Artfinder and today’s ‘Your Paintings‘ from the BBC and the Public Catalogue Foundation, I’ve been wondering what space is left for galleries online. (I’ve also been thinking about Aaron’s “you are about to be eaten by robots” and the image of Google and Facebook ‘nipping at your heels’ to become ‘the arbiter of truth for ideas’ and the general need for museums to make a case for their special place in society.) Between funding cuts on the one hand, and projects from giants like Google and the BBC and even Europeana on the other, what can galleries do online that no-one else can? So I asked on twitter, wondering if the space that was left was in creating/curating specialist interest and/or local experiences… @bridgetmck responded “Maybe the space for museums to work online now is meaning-making, intellectual context, using content to solve problems?” The idea of that the USP of an museum is based on knowledge and community rather than collections is interesting and something I need to think about more. The twitter conversation also branched off into a direction I’ve been thinking about over the past few months – while it’s great that we’re getting more and more open content [seriously, this is an amazing problem to have], what’s the effect of all this aggregation on the user experience? @rachelcoldicutt had also been looking at ‘Your Paintings’ and her response was to my ‘space’ question was: “I think the space left is for curation. I feel totally overwhelmed by ALL THOSE paintings. It’s like a storage space not a museum”. She’d also just tweeted “are such enormous sites needed when you can search and aggregate? Phaps yes for data structure/API, but surely not for *ppl*” which I’m quoting because I’ve been thinking the same thing. Have we reached a state of ‘death by aggregation’? Even the guys at Artfinder haven’t found a way to make endless lists of search results or artists feel more like fun than work. I’m still thinking it all through, and will probably come back and update as I work it out. In the meantime, what do you think? The tl;dr version: inspiring project, great enhancements; yay! Longer version: last night I went to the offices of We Are What We Do for a preview of the new version of HistoryPin. Nick Poole has already written up his notes, so I’m just supplementing them with my own notes from the event (and a bit from conversations with people there and the reading I’d already done for my PhD). New features will include a lovely augmented reality-style view in streetview; the ability to upload and explore video as well as images; a focus on telling stories – ‘tours’ let you bring a series of photos together into a narrative (the example was ‘the arches of New York’, most of which don’t exist anymore). You can also create ‘collections’, which will be useful for institutions. They’ll also be available in the mobile apps (and yes, I did ask about the possibility of working with the TourML spec for mobile tours). The mobile apps let you explore your location, explore the map and contribute directly from your phone. You can use the augmented reality view to overlap old photos onto your camera view so that you can take a modern version of an old photo. This means they can crowdsource better modern images than those available in streetview as well as getting indoors shots. This could be a great treasure hunt activity for local communities or tourists. You can also explore collections (as slideshows?) in the app. They’re looking to work with more museums and archives and have been working on a community history project with Reading Museum. Their focus on inclusion is inspiring, and I’ll be interested to see how they work to get those images out into the community. While there are quite a few ‘then and now’ projects focused on geo-locating old images around I think that just shows that it’s an accessible way of helping people make connections between their lives and those in the past. A quick correction to Nick’s comments – the Historypin API doesn’t exist yet, so if you have ideas for what it should do, it’s probably a good time to get in touch. I’ll be thinking hard about how it all relates to my PhD, especially if they’re making some of the functionality available. A quick report from hack4europe London, one of four hackathons organised by Europeana to ‘showcase the potential of the API usage for data providers, partners and end-users’. I have to confess that when I arrived I wasn’t feeling terribly inspired – it’s been a long month and I wasn’t sure what I could get done at a one-day hack. I was intrigued by the idea of ‘stealth culture’ – putting cultural content out there for people to find, whether or not they were intentionally looking for ‘a cultural experience’ – but I couldn’t think of a hack about it I could finish in about six hours. But I happened to walk past Owen Stephen’s (@ostephens) screen and noticed that he was googling something about WordPress, and since I’ve done quite a lot of work in WordPress, I asked what his plans were. After a chat we decided to work together on a WordPress plugin to help people blog about cool things they found on museum visits. I’d met Owen at OpenCulture 2011 the day before (though we’d already been following each other on twitter) but without the hackday it’s unlikely we would have ever worked together. So what did we make? ‘Share What You See’ is a plugin designed to make a museum and gallery visit more personal, memorable and sociable. There’s always that one object that made you laugh, reminded you of friends or family, or was just really striking. The plugin lets you search for the object in the Europeana collection (by title, and hopefully by venue or accession number), and instantly create a blog post about it (screenshot below) to share it with others. 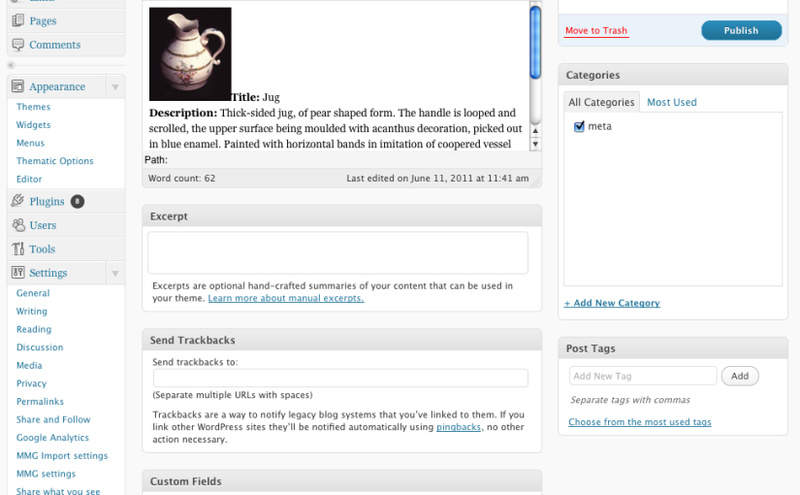 Screenshot: post pre-populated with information about the object. Once you’ve found your object, the plugin automatically inserts an image of it, plus the title, description and venue name. You can then add your own text and whatever other media you like. The plugin stores the originally retrieved information in custom fields so it’s always there for reference if it’s updated in the post. Once an image or other media item is added, you can use all the usual WordPress tools to edit it. If you’re in a gallery with wifi, you could create a post and share an object then and there, because WordPress is optimised for mobile devices. This help makes collection objects into ‘social objects’, embedding them in the lives of museum and gallery visitors. The plugin could also be used by teachers or community groups to elicit personal memories or creative stories before or after museum visits. The code is at https://github.com/mialondon/Share-what-you-see and there’s a sample blog post at http://www.museumgames.org.uk/jug/. There’s still lots of tweaks we could have made, particularly around dealing with some of the data inconsistencies, and I’d love a search by city (in case you can’t quite remember the name of the museum), etc, but it’s not bad for a couple of hours work and it was a lot of fun. Thanks to the British Library for hosting the day (and the drinks afterwards), the Collections Trust/Culture Grid for organising, and Europeana for setting it up, and of course to Owen for working with me. Oh, and we won the prize for “developer’s choice” so thank you to all the other developers!